In this case there were several requirements that made it difficult to find an off the shelf product that would accomplish the task. The belt had to have cleats and side walls to contain the product, in this case a ceramic material being dumped into a hopper. The conveyor had to have a specific height to reach the hopper, in this case a little over 9 feet. There also had to be a short flat section at the bottom to catch the product as it was “scraped” off of a cooling table. Since I had decided to build the cooling table and cart myself I also decided to build the conveyor. I had done a lot of controls work for Smalley Manufacturing, a Knoxville, Tennessee food service conveyor manufacturer, so I talked to them first. 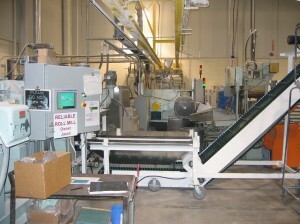 They had a lot of resources they use for conveyor parts and are also a reseller of components. They helped me find a belt and rollers that were appropriate for the job. I also looked on the internet and found several standard conveyor component vendors to provide items such as the shafts, bearings and other odds and ends. Many of the UHMW parts were made by a local machine shop according to our drawings. The sides and structural elements were made of tube and plate steel. One of the things I learned during this process was the value of the proper tools. We had a mill, lathe and Ironworker, but most of our cutting and welding equipment was not up to the task. The steel plate was 10″ by 1/4″ and all we had at the time was a cutoff saw with an abrasive blade, a portaband and a bandsaw. Needless to say we spent much more time cutting steel than was economical. The steel came in from the vendor in manageable lengths but angles had to be cut, holes drilled and tube cut and welded. It was an adventurous time for me as I only had two employees at the time in addition to my wife and daughter, who helped immensely. It was also summer in Knoxville and we had to keep the back doors open to allow the metal fumes and smoke to escape. Wearing a welding jacket in 95 degree heat with 90% humidity was rough! All in all it was a great experience and I learned a lot both about conveyors and fabrication. This experience prompted me to purchase several more important tools including a roll-in bandsaw and a better welder. Despite starting out as a purely controls oriented company I found that I enjoyed the challenges of learning new things and solving mechanical problems. This conveyor, the water cooling table and integration into the existing plant roll mill system took about 4 months from the initial purchase order until installation. For anyone wanting further information on this application or any other I am always happy to share. There are many resources available on the web through various conveyor manufacturers. 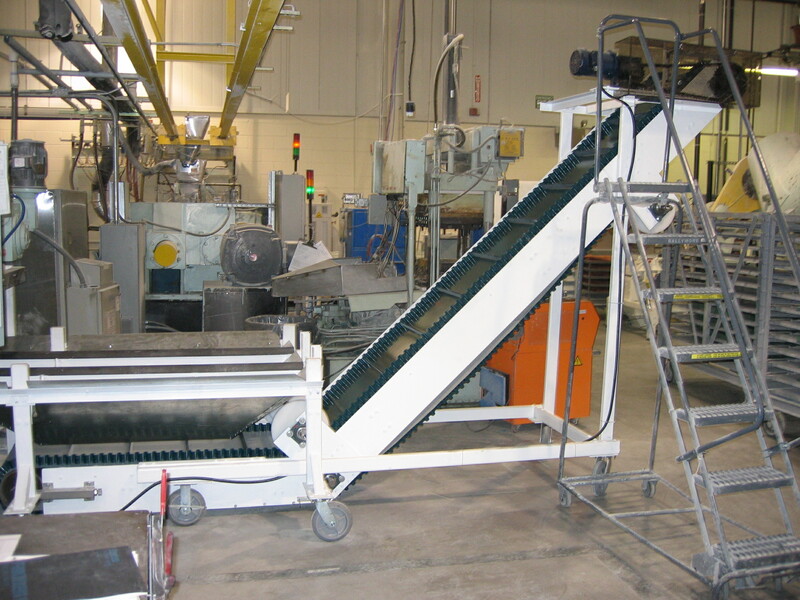 There is also a forthcoming section on the Automation Primer section of this site dedicated to conveyors and other special purpose systems such as vibratory bowls, stepfeeders, etc. Stay tuned for more! Do they make the chiller plate also? Conveyors are not be a very glamourous subject, but in today’s fast paced world, we’d be lost if they weren’t there. Parcels would not get delivered, things would get broken as they were passed from person to person. 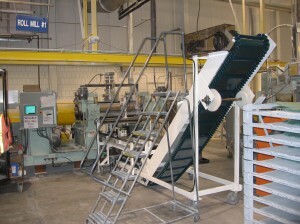 And the thing is that not all conveyors are the same, and nor are the companies that manufacture them. I have been speaking to Rusmail in the UK and I can tell you that they know their subject! I have an idea for a conveyor belt to carry drinks from my BBQ island to a seating area in my backyard for the purpose of delivering drinks. Does anyone know if such a product exists? Any suggestions on how to build? I think what you would want is a tabletop chain conveyor. 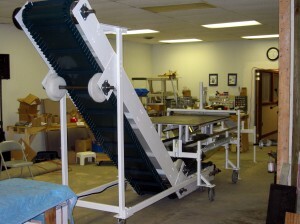 It can be built out of standard components from a company like Dorner Conveyors (www.dornerconveyors.com). The surface is a thermoplastic chain with flexible links so it can turn fairly easily. I built one for TRW Toyoda back in about 2004 that would have made a great drink type conveyor. A few things to think about: 1. The motor is usually at the head of the conveyor, i.e. at your seating area. Do you have power available there? 2. There is a limit as to how long a single chain can be. You may need more than one section, i.e. more motors. The transition from one conveyor to another then becomes tricky for something like a glass. 3. You may want to use small pallets to hold the glasses. Then there is the problem of returning the pallets: you could just carry them back later or use an over-under return conveyor. The frame can be built out of angle iron or aluminum extrusion. 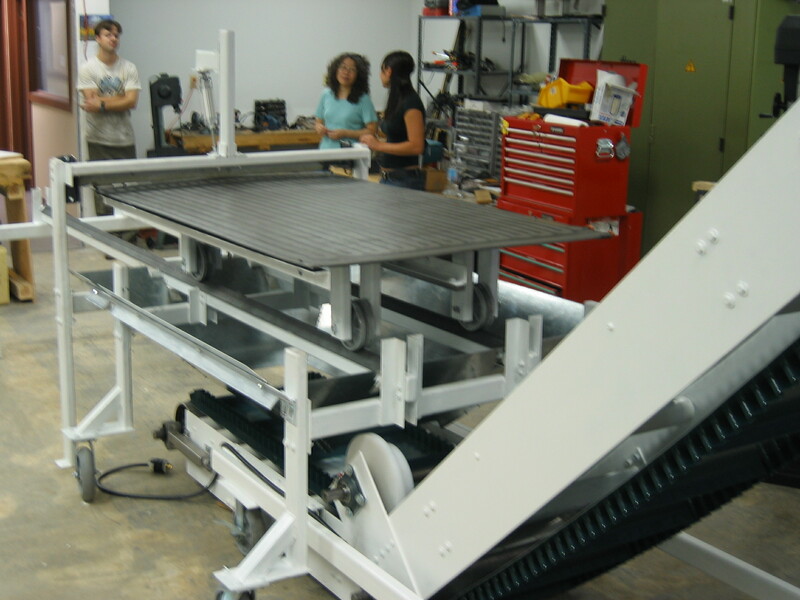 You can order the extrusion and conveyor components as a kit and assemble it yourself with hand tools. Sounds like a fun project! A restaurant in our area uses a model train to deliver beverages to the table, an O-gauge model, I believe. That would be simple to set up. You could use a photodetector and relay to stop it at the location that you desire. Mahajan Conveyors manufacturers Conveyor Belts, Rubber Belting, Elevator Conveyor Belts, Rubber Conveyor Belts, Industrial Conveyor Belts, Conveyor Rubber Belts, Flat Transmission Rubber Belts.